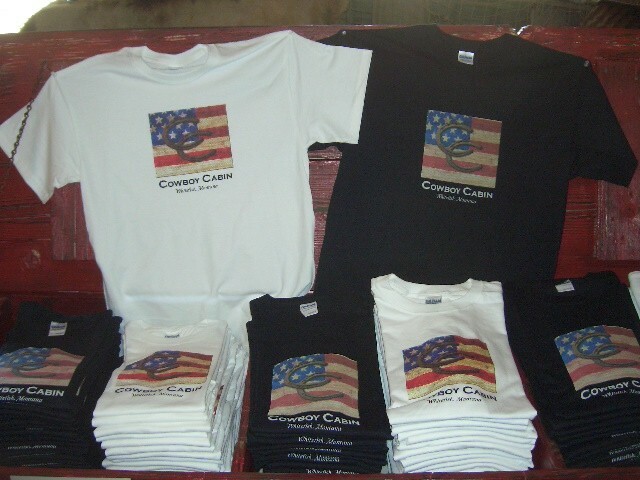 We have two color choices of high qualtity T-Shirts Black and White. Sizes M, L, XL, 2X and 3X price is $16.50 plus shipping. Our Logo was designed by Clint Walker and can be reached for marketing thru Cowboy Cabin. We have two color choices of high qualtity T-Shirts Black and White. Sizes M, L, XL, 2X and 3X price is $16.50 plus shipping. Our Logo was designed by Clint Walker and can be reached for marketing thru Cowboy Cabin. Please email cowboycabin@centurytel.net with questions or call 406 270-2842.